'Hinnomaki Red' Gooseberries were developed in the early 1900s!! I am shouting the title of this blog post at the top of my internet lungs, folks. I consider myself a pretty decent googler. It generally only takes me a good 15 minutes max to google even the most obscure topics. 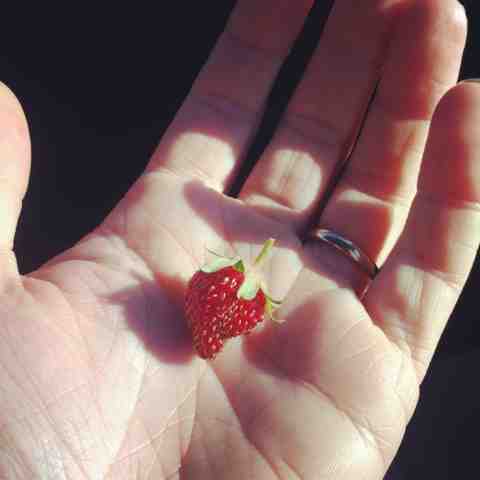 Well, this morning I bought myself a Hinnomaki Red gooseberry at the Sara Hardy Farmer's Market in Traverse City. I had a hunch it was an heirloom, but wasn't totally positive on its intro date. I knew it was at least pre-1930, but beyond that... well.. I figured I'd buy it and google it later. So! I found out through a basic search that Hinnomaki Red (and Yellow and Green) are hardy cultivars introduced from Finland. Beyond that, there is nothing in the American Google results. Nada... at least not in the first 15 pages or so. I found sites that called them heirlooms, sites that called them new introductions and sites that ignored the history of the variety altogether. After the U.S. Google failed me I decided to get serious. I found the URL for the Finnish Google and started googling Hinnomaki, after which I discovered the repetitive use of "Hinnonmaki" and some other similar words. I then was struck with a stroke of genius and wandered over to a Finnish dictionary site and looked up the word for "Introduced" which turned out to be "esitellä". After that it was as simple as pie! I just plugged in the words "Hinnonmaki" and "esitellä" and up came a web site about the various Finnish varieties of Gooseberry! This home-like, the ever-popular variety was bred in the early 1900s. This is somewhat powdery mildew resistant variety was bred in the early 1900s Hinnonmäen test station. Finally! Now I not only know when it was bred, but where! I feel like I have attained all new Google Mastery. I should get a badge or something! So I'm putting this blog post up specifically for people out there who are looking for a breeding date on the Hinnonmaki or Hinnomaki Red gooseberry. Early 1900's. I'll keep looking for a specific date, but... there ya go, plant geeks! For anyone who doesn't follow me on facebook or instagram I thought I'd share my other phone-photos while I can. I've got loads of other photos on my camera that I can't wait to share, including some photos of young experimental antique European trees being grown at a local orchard! The colors of the bay were so vivid I couldn't believe it! 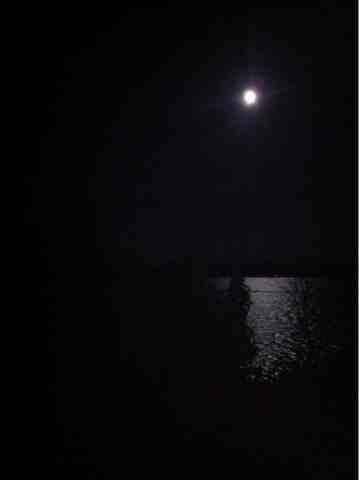 The moon over lake Leelanau was erie in ways I had never known. Ha. 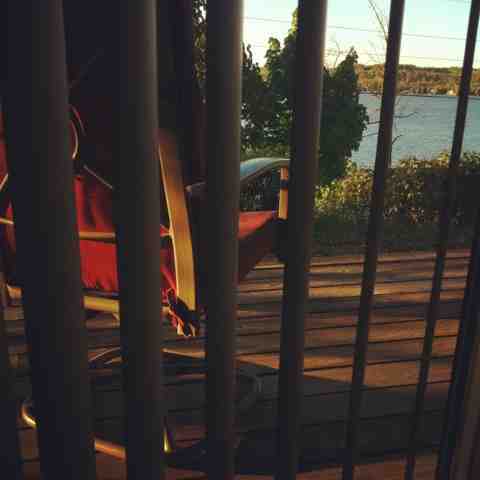 This is the view I awoke to, at whaleback inn in Leelanau. I scored some native edibles at the Leelanau Conservancy plant sale! 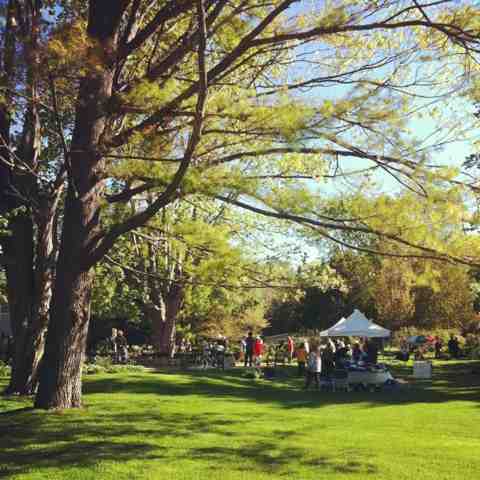 The trees at Good Neighbor organic winery were in full bloom and intoxicatingly sweet. 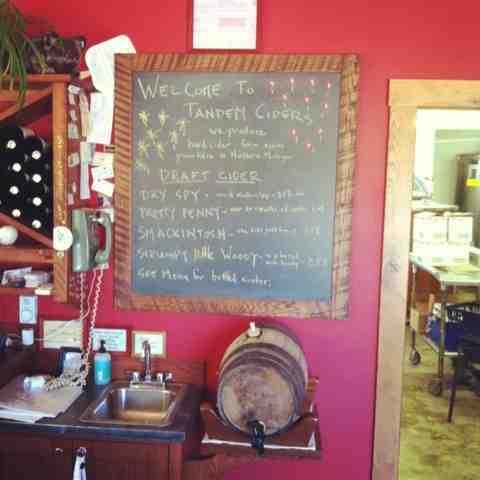 This is a shot of the amazing draft coders available at Tandem Ciders, my favorite state-side cidery! 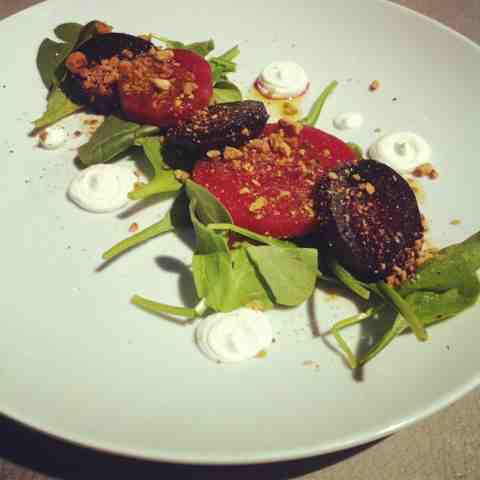 I had the most amazing lunch at Black Star Farms in Sutton's Bay. There were subtle hints of fennel pollen - my fav! And then this happened and I will forever be scarred. 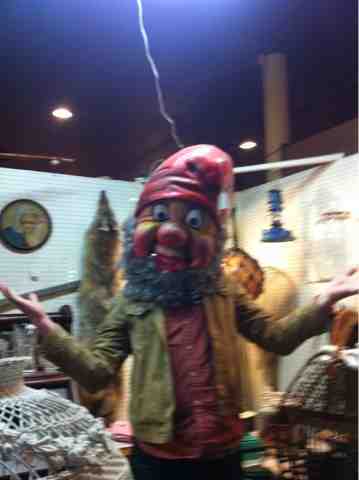 Thanks, Wilson's Antiques, for a life's worth of nightmare fodder in a matter of minutes. I am traveling, this weekend, through what in my opinion is the most wonderful area of the country. 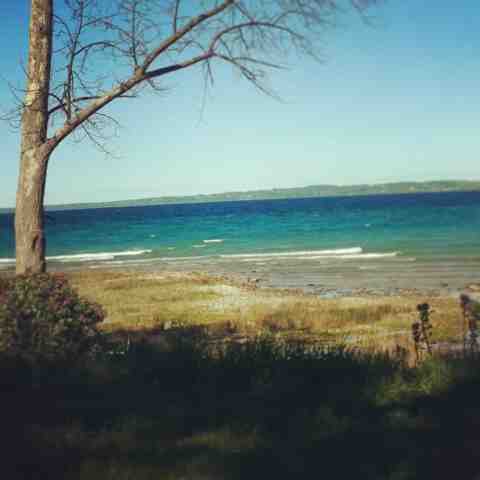 The northwest tip of the lower peninsula of Michigan is amazing, folks. My last two days have been chalk-full of adventures at wineries, orchards, cideries, antique stores, lake fronts and more. I have hiked dunes and run my fingers through soft grasses an marveled at the colors of the waters of Lake Michigan and I have giggled at curly-haired pigs grunting at us from behind weather-patinaed fence rails at Black Star Farms. This place is intensely beautiful and so are the artisan bakers, brewers, makers and do-ers here. This morning I visited the Boss Mouse Cheese booth at the Sara Hardy Farmer's Market in Traverse City. I met Sue Kurta a few years ago and she is just spectacular - as much so as her amazing cheeses! 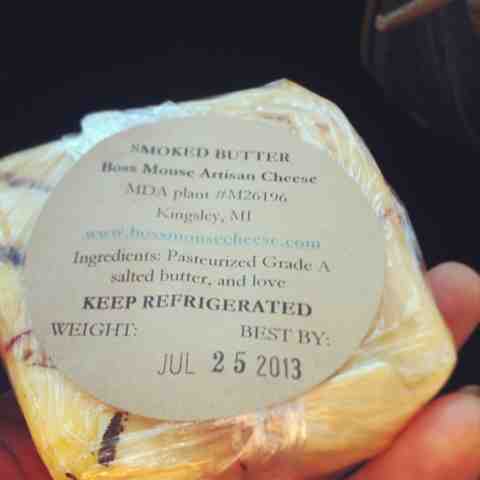 We talked a while and before I left I bought chunks of her cloth bound cheddar, rosemary montasio and smoked butter. I am in heaven! My poor ewes. Every spring, since I brought my first sheep home, our fuzzy friends have always had a bit of a cough and nasal discharge. It's never been bad; it's always cleared up on it's own, but it also always seemed to pop up again when it would be particularly rainy. After talking to several other shepherds and shepherdesses, and a couple of vets, I settled on "mysterious allergies" and tried to stop cringing when I heard the all-too-humanlike hack come from the field. Then, last night while I was out putting up the ducks and chickens, I noticed they were doing it again! This is a video another shepherdess has posted of her sick sheep, and it shows the exact behavior that my sheep have been exhibiting. It's creepy behavior, too! One of the comments below suggests nose bots, so I started reading up on them and sure enough the symptoms fit precisely, right down to the slight nasal discharge. Last night I dug around until I actually managed to find my bottle of ivermectin and a spare sheep drenching gun (like a super heavy duty needle-less syringe that we use to give them liquid meds/vitamins) and armed with my handy-dandy headlamp (aka face-bug-target) I headed out to the barn and drenched them all with ivermectin, as well as vitamins A, D, B and E, selenium and magnesium just for the helluvit. They actually all drenched fairly easily; I usually have to bring Jeremy along to be the muscle, but I've been shoveling treats down their throats in an effort to make bringing them off the grass an easier task, and apparently this has paid off and they all "like" me now... Haha. Bribery will get you EVERYWHERE in the livestock world! Anyway, I'll keep an eye on them, but this should at least take care of the current nose bot issues. I'll have to come up with some sort of repellent or something for them for the rest of the year though, or else I'll have to keep worming them which I really hate to do. I had been so proud, too, because I'd been chemical-free for so many months with no parasite issues... damn. 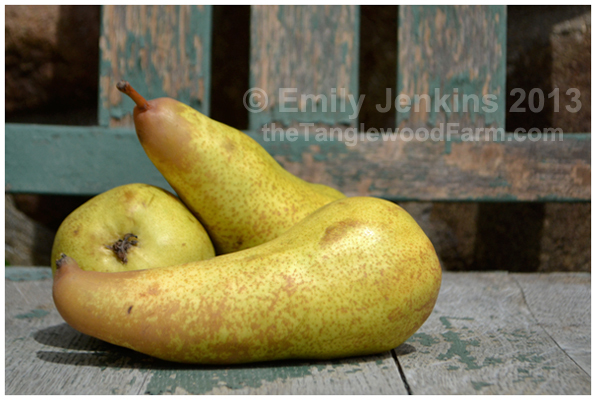 The Williams' pear is more commonly known in the states as the Bartlett, and is the most readily available of the varieties I've posted so far. Here in Michigan, the staples tend to be Bartlett, Bosc and D'Anjou pears, as far as commercial varieties go. Unfortunately I am not a huge fan of the Williams' pear. When ripe, its flavor edges toward simple, with powerful citrus notes that really dominate the senses. It certainly doesn't hold the subtleties that the other varieties I've written about do. 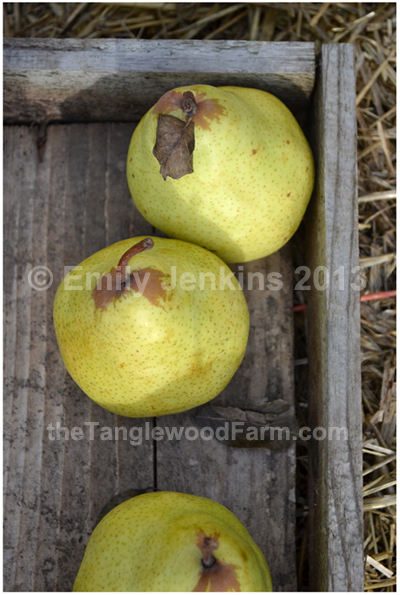 It's still a very old pear, which makes it worth writing about (at least on the blog), and is thought to have originated in the late 1760's in Aldermaston, England. Did you know Forelle means Trout in German? I'm learning all sorts of fun pear-y facts this week. The Abate Fetel is, from what I can tell, a late 19th century pear developed by a French monk (Abate = Abbot). The thing is, from preliminary internet research, I've found all sorts of conflicting information about its development! The only formally published information about it that I could find was that it was in a book from 1886, claiming it was a new cultivar available from France. I have found orchard and nursery sites claim it to be developed in 1866, and other sites that say it was bred by monks in the 16th century. How frustrating! I'm beginning to wonder if the tree itself was developed by monks way-back-when, but it wasn't released as scions for commercial production until 1866... It certainly didn't make it over to the states until the 1880's though. It's now one of the top pears in Italy, which is additionally frustrating because when I use the internet to search for information all I get are Italian websites talking about modern fruit production and export. Boo. Ah, the woes of researching antiquated fruit varieties... the fruits themselves are hard to find, but real, fact-based documentation of them is even worse! More often than not I find myself reading accounts from folks' great-great-great grandfathers who ran orchards and whatnot. Anyway, I began playing with photographing some of the few antique varieties that I have access to in this off season. When I went to pick up the new pears, I blurted my story to the guy ringing me up (who was actually in training, the poor chap) and when he and his supervisor made weak and very polite attempts to "connect" and seem interested, I heard myself begin to spout off the history of the Packham's pear to them and instantly knew I'd begun to edge toward crazy-pear-lady-status. I stopped, almost mid sentence, to spare them the bulk of my mania. My brother, who had been standing on, said later that he was proud of me for stopping myself... and something to the effect that he was sure I was going to be that guy's "First day at work, is everybody this crazy?" story. When does a project go from "project" to "obsession"? Hmm... food for thought. 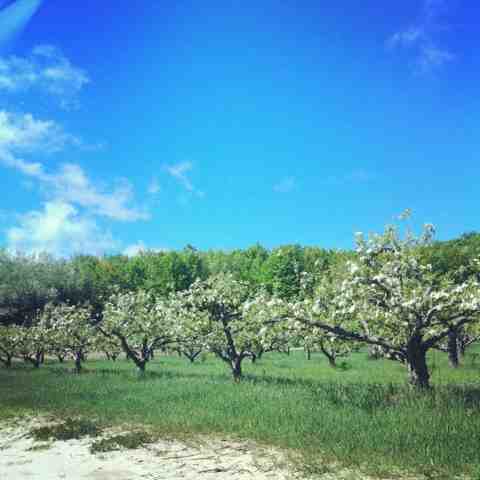 Having actually started accumulating fruit and taking photographs as got me so excited for this summer; you have no idea. I've decided to begin research for a book. I'm not sure if I'll ever get it published, or if I'll self publish it, or if I'll just sit at home and clutch it and smile and rock back and forth while humming. Anyway, if you've been following the blog you know that I love food and and I love history. There are spectacular books on heirloom vegetables out there, and on growing fruit, but for years I've been looking for a really nice book on heritage/heirloom fruits and there just isn't much out there. Trust me, I've found all of the pretty good ones, but I still haven't managed to find a spectacular book that encompasses all that I'm looking for. So, a few months ago it just kind of clicked in my brain. As with all things in my life, if it doesn't exist and I want it to, I'll gosh-darned-do-it-myself! So over the next few years I'll be gathering information, traveling and tasting, documenting and photographing, and I'm sure someone else will write and publish that special book that I'm looking for, right before I find myself feeling "finished" but that's okay. Share with me your favorite pre-1939 fruits, and let me know when you spot heritage or heirloom fruits for sale. I'm going to be doing some traveling specifically for this project, so if you know of a place that grows fruits from the past, let me know! 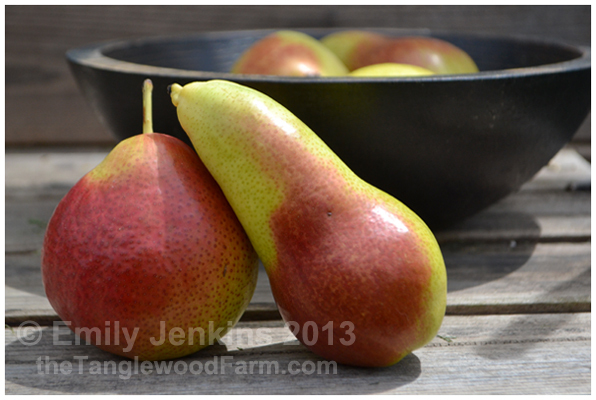 If you spot that perfect Doyenne Gris pear at your local market, shoot me a facebook message! I'm particularly interested in stone fruits and berries since they seem to be harder to find old varieties of. You can follow the farm facebook page here. I'm really hoping to use that page to collect some heirloom sightings from readers, friends and families. If you're not sure if it's an heirloom, post it anyway and I'll do some research on it!